In coordination with the United Nations Mediation Support Unit and in collaboration with a number of other mediation institutes and experts, USIP is developing a series of "best practices" handbooks on key aspects of mediation and peacemaking. The series is being designed for experienced mediation practitioners and negotiators, but will be a valuable resource for students and policymakers. Future handbooks include: Negotiating with Terrorists, Dealing with the Impact of an International Tribunal on a Peace Process; and Coordinating Track I and II Efforts. Failure by mediators to fully assess the interests and positions of negotiating parties and accurately identify the strategies and tactics conflict parties employ to avoid disarming and demobilizing their fighting forces can greatly compromise the viability of disarmament, demobilization, and reintegration (DDR) programs. Providing guidance on the mediation and negotiation aspects of DDR, this toolkit lays out eight detailed steps that mediators can take to establish appropriate linkages between DDR and other aspects of a peace process. This handbook poses and attempts to answer a series of basic, but complex, questions: Is there any advantage to the peace process in inviting or permitting the participation of proscribed armed groups (PAGs)? What kinds of PAGs are worth talking to and which are not? What form should the talks take and whom should they involve? In the conflict resolution realm, track II peacemaking or diplomacy has become increasingly common, complementing the more formal track I peacemaking efforts in myriad ways and at various points throughout a peace process. Conducting Track II Peacemaking presents the process of track II intervention as a series of steps that guide peacemakers in coordinating various track II efforts to maximize their positive impacts. 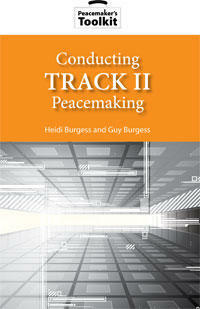 This volume is the seventh in the Peacemaker’s Toolkit series. Determining how to work with the many external actors involved in any peace process is a critical issue for peacemakers. 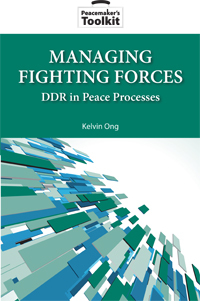 This volume explores how peacemakers can productively work with informal mini coalitions of states or intergovernmental organizations that provide support for resolving conflicts and implementing peace agreements—an innovation often referred to as groups of “Friends.” Using lessons learned from successful and less effective examples of peacemaking, the author introduces five steps for mediators who may consider working with these groups. Leading experts on mediation and the plight of internally displaced persons (IDPs) collaborated to produce this handbook, which gives mediators the tools they need to incorporate IDPs' concerns into peace processes and agreements. Achieving such integration will not only safeguard the rights and interests of IDPs as stakeholders in a peace process but will also help mediators reach a negotiated and lasting settlement for all the parties involved in a conflict. This handbook examines interviews conducted with mediators to learn lessons about their mediation “method.” These methodological debriefings are typically conducted by individuals who have not been directly involved in the mediator’s work but who want to learn the mediator’s perspective on what was done and why it was done. This handbook enhances the practice of mediation by showing how lessons from individual mediators can be identified and made available both to their organizations and to a wider practitioner audience. 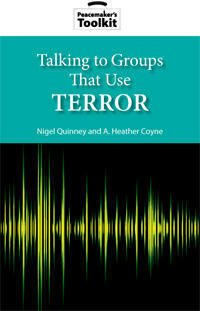 It also gives guidance to staff debriefing mediators who are or have been directly involved in peace negotiations. A mediation initiative cannot be launched at just any time if it is to succeed. The conflict must be ripe for the initiation of negotiation. Parties resolve their conflict only when forced to do so-when each party’s efforts to achieve a unilaterally satisfactory result are blocked and the parties feel trapped in an uncomfortable and costly predicament. This toolkit lays out five steps mediators can take to assess whether a stalemate exists; interpret the parties’ perception of where they stand in the conflict; and encourage a ripe moment for mediation. The second handbook of the Peacemaker’s Toolkit series, Managing Public Information in a Mediation Process helps mediators identify and develop the resources and strategies they need to reach a variety of audiences, from governments and rebel forces to local and international media, NGOs and IGOs, divided communities and diasporas. It highlights essential information taks and functions, discusses key challenges and opportunities, and provides expert guidance on effective approaches. Examples from past mediations illustrate how various strategies have played out in practice. Managing a Mediation Process is the first handbook of the Peacemaker’s Toolkit series. This handbook provides a methodology for mediating interstate and intrastate conflicts. Each of the six chapters covers a different step in the process, identifying what needs to be done at that step and how best to accomplish it. By consolidating the practical wisdom of managing a mediation process into an easily digestible format, Managing a Mediation Process is designed to help mediators identify areas where they may need more research or preparation, as well as develop options and strategies relevant to the particular case on which they are working. The web version of Managing a Mediation Process allows readers not only to view and search the full text of the handbook but also to link instantly to more detailed resources, including analyses, educational materials, tools, and news.